Carrots are one of the most popular vegetables in the world. They are a rich source of essential nutrients and minerals. Carrots get their color from antioxidants known as carotenoids. One of those carotenoids is beta-carotene, a precursor of vitamin A that provides many of the carrot and carrot juice benefits. Daily drinking of carrot juice is a habit that everyone should have, as it is healthy and tasty as well. Carrot juice offers you a powerful release from numerous seasonal allergies such as hay fever, as it detoxifies your blood and lowers the inflammation. Carrot juice clears the heat and the irritation from the respiratory tract, so you can breathe easy again and find a relief from the season allergies. Carrot juice has alkalizing effects and relaxes the skin and eyes showing the blood purifying effects. Beta-carotene, which gives the color of the carrot juice metabolizes into active vitamin A when mixed with bile salts in the small intestine. Vitamin A is nourishing to the liver and purifies the blood. The mild bitter taste of the carrot juice enhances this blood purifying effect as it gently cleanses the liver. Evidences suggest that consuming high quantities of carrot juice can be protective against the recurrence of cancer. Carrots contain antioxidant Falcarinol, which have anticancer properties. Studies show that antioxidants in carrots may be able to fight leukemia and may reduce the risk of some of the most widespread cancers such as ovarian and breast cancer. In a study performed on mices and rats induced with colon cancer has been shown that the consumption of carrot juice reduces the occurrence of cancer in one-third of the experimental animals. Juicing carrots makes the skin noticeably smoother, softer and firmer. Too much of the concentrated carrot juice can make your skin orange, but the effect is harmless. Carrots also help heal wounds faster due to their high content of carotenoids. 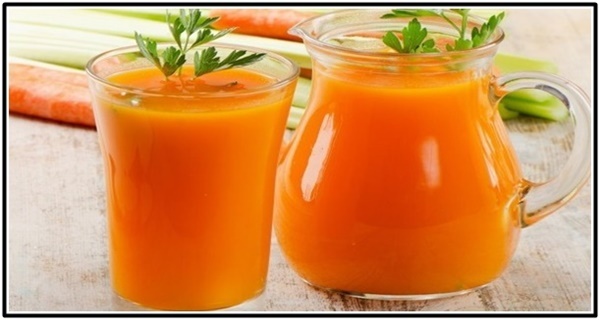 During pregnancy carrot juice enhance baby’s complexion while lowering the risk of jaundice. The blood purifying properties of carrot juice make it an excellent blood and liver tonic. Carrots are ideal for the liver especially in the late summer days. If you want to enhance this liver tonic, you can mix it with nettle tincture, coconut juice, and blueberry juice. Despite the sweetness, carrots maintain the levels of blood sugar. You should avoid it if you have candida or other sugar sensitivities. In kids, one cup fresh carrot juice can help to remove roundworms and pinworms from the intestines. Juicing tip: Nutrients in carrots are more concentrated near and around the skin, so use organic, unpeeled carrots. For best effects, juice the carrots using a cold-press juicer. Previous post: Do You Realize What You Have Eaten When Cooking Food In Aluminum Foil?